The last Sunday in Ordinary Time is this Sunday, and we celebrate the Solemnity of Christ the King. (In the Extraordinary Form calendar this is the last Sunday in October before the Feast of All Saints). This feast was established by Pope Pius XI in 1925, so the traditions attached to this day aren't as long standing as feasts from the early Church. My view is make today's dinner a celebration, a royal dinner, as if Our King would be sharing our Sunday family meal. I strive to make Sundays a special family meal anyway, but this day will have a bit more regal treatment. Our plans for Sunday will include a ham, potatoes, green beans, rolls, and for dessert, a Kahlua Cake in a crown shaped Bundt pan and royal cupcakes. I chose ham because I know Thanksgiving week is going to be busy, so having leftover ham for meals, and also a hambone to make Red Beans and Rice will make my meal planning and preparing a breeze, so more time to clean and cook for Thanksgiving. The ham I buy is from Costco. I follow the reheating instructions, 325 degrees at 8 minutes per pound, but I do not use the glaze packet since it includes wheat flour, and my son is allergic. I instead follow the recipe from the old version of Joy of Cooking for Spirit Glaze for Ham. This is extremely tasty and keeps the ham nice and moist. Heat all ingredients in a small saucepan until sugar is melted. Pour over the ham and baste throughout the cooking cycle, about every 10-15 minutes. Ham not your style? Then how about a fancier version of Chicken a la King? For dessert, I'm preparing allergy safe cupcakes for my son, decorated with jewel like candies (gumdrops and jelly beans), and then a Castle/Crown shaped Bundt pan with our favorite chocolate cake. It's easy but so delicious, and food fit for a King. Preheat oven to 375 degrees. Grease and flour (or use unsweetened cocoa) a Bundt or tube pan. For a crown shape I'm used a cathedral Bundt pan, similar to this Nordicware. Mine is a bit smaller than the usual Bundt, so it makes 3 cupcakes and the cake. Mix all ingredients except chips together and beat 2-3 minutes. Add chocolate chips and beat 1 minute. Pour into a greased and floured Bundt or tube pan and bake for 50-55 minutes. It's okay to undercook -- better moist. If toothpick inserted has a few crumbs but not liquid, cake is ready. Before serving (after cooled) sprinkle with confectioner's sugar. So that's my simple crown cake -- the round Bundt pans immediately remind me of a crown, but perhaps I'm just too simplistic and looking for easy ways to celebrate. Other crown ideas could also make the lovely Cookie Crown Cake from Family Fun Magazine or Crown Cake from Helen McLoughlin. Or veer in another direction and make a version of King Cake, because, after all, it's always good to practice or try out recipes. Over at my blog I have some music and centerpiece craft (coloring page) appropriate for Christ the King Sunday. 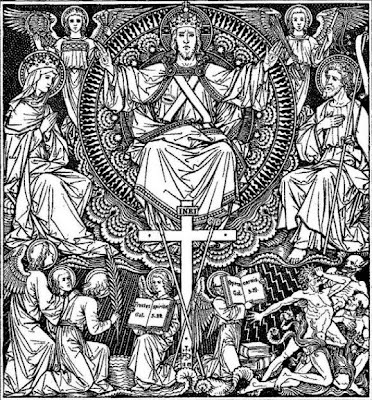 May Christ our King reign in our hearts and our homes! What a great meal plan. The Kahlua cake sounds delicious, Jenn. From Thy Bounty Fair: Holiday Foods and Feasts!